DirecTV and the Pac-12 Networks remain at a stalemate, six years after the network launched. In the Times' first installment of Pac-12 Hotline, Jon Wilner dives into why. I spent years trying to locate Derek Chang, to no avail, and eventually gave up trying. But a tip from a source this summer — ”Last I heard, he’s in Singapore” — re-started the search and led me, eventually, to Chang. To the executive vice president for content strategy for DirecTV (i.e., it lead negotiator) prior to the launch of the Pac-12 Networks. Turns out, Chang does not hate the Pac-12. In fact, he’s a Stanford business school grad who took endless heat from classmates for not signing a carriage deal with the conference. You're reading the first installment of The Seattle Times' partnership with the Bay Area News Group, bringing Jon Wilner's Pac-12 Hotline to the Times and seattletimes.com. We're excited to welcome Wilner and his award-winning college sports coverage into the fold. Follow him on Twitter: @wilnerhotline. Locating Chang, who works for Scripps and is now based in London, was a breakthrough in my attempt to piece together the details of the stalled negotiations between the Pac-12 and DirecTV. Even better: Chang agreed to talk on the record, to the extent that he could recollect, about the impasse that began in the spring of 2011 and remains in place today. The account below is based on interviews with Chang, Scott and numerous other Hotline sources with direct knowledge of the Pac-12 Networks’ negotiations with DirecTV (and other distributors) during the pre- and post-launch windows. You can blame one side or the other — you can curse DTV or rail against Scott and the Pac-12 — but ultimately, both sides made decisions that served their best interests … and led them down paths that would never intersect. The story begins long before the stalemate appeared on the public radar. It begins in the early months of 2011, a full year-and-a-half before the expiration of the Pac-12’s media rights deal with ESPN and Fox. “We didn’t have a specific model for a TV network predetermined,’’ Scott recalled. “We were the conference of champions. We felt we should have a platform for the student athletes. From a brand perspective and a DNA perspective, if we were the best in the country, we ought to show it. “But the RSNs (Fox’s array of Regional Sports Networks) were a mixed bag. A lot of games were not available regionally. There was a tremendous deficit of coverage of football and basketball. And outside of sports, we felt it would be great if we could create an asset for the conference — having control, not just licensor rights, had appeal. Scott went first to ESPN and Fox and discussed a model similar to the Big Ten Network — a joint venture with financial guarantees and carriage leverage. He described the discussions as “meaningful” and even received proposals. 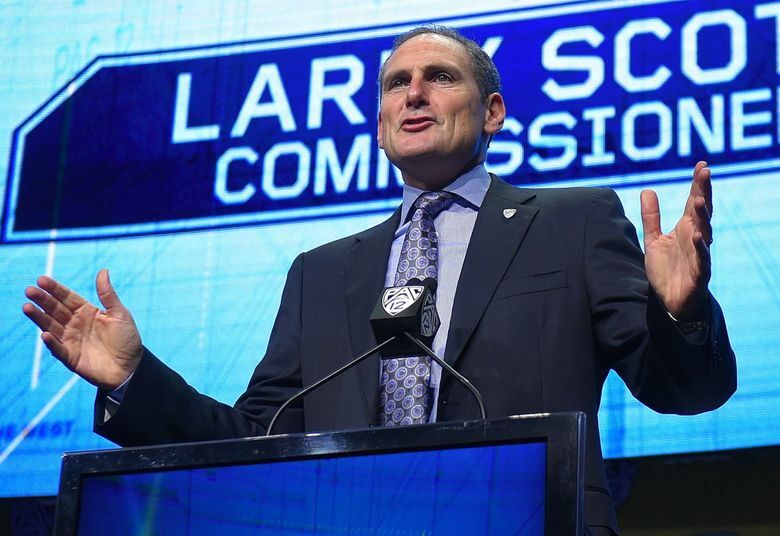 On May 3, the conference unveiled the $3 billion Tier 1 deal with ESPN and Fox — and, behind the scenes, immediately began courting partners for what would become the Pac-12 Networks. First stop: Mr. Derek Chang. “If you’re going to launch a national network, the best place to start is with a satellite provider,’’ said a source with knowledge of the Pac-12’s strategy. “(The Pac-12) started with Chang and said, ‘We’d like you to be our partner. Buy from us wholesale so you don’t have to pay the retail rate.’ This was long before there were any substantive discussions with the cable companies. When viewed from DirecTV’s perspective, Chang had good reason for balking: Programming costs were soaring, affecting the margins for distributors. “We were trying to hold the line,’’ he said. And to an extent, DirecTV was already paying for the Pac-12 content. The $3 billion outlay by ESPN and Fox would, over the 12-year deal, be passed on to the distributors (like DirecTV, Comcast, etc.) in the form of increased subscriber fees. And that was for the premium football and men’s basketball games on the Tier 1 networks. Now the conference, in the form of a direct partnership with the Pac-12 Networks, was asking DirecTV to pay for the second-tier content, as well. “The packaging not quite right initially,’’ Chang said. Time Warner, Comcast, Bright House and Cox would guaranteed the Pac-12 cash upfront (to pay for the launch costs), annual income and initial carriage into millions of homes. But the cable connection added stress to the DirecTV discussions during the year-long run-up to the launch. The key letters in that comment: MFN. They stand for Most Favored Nation, the term used to describe a model for structuring carriage deals. MFNs guarantee the same fees for all distributors of given a content package, regardless of when they come on the scene. Tier 1, the most expensive at approximately $0.80 per subscriber per month, was for the primary DMA (Designated Market Area). For the Pac-12/Bay Area feed, for example, this would be San Francisco. Tier 2, believed to be in the $0.50 range, was for the outer DMA (i.e., Sacramento). Tier 3, in the $0.10 range (approx), was for the Out-Of-Market region: Outside the conference’s six-state footprint. This was a standard approach to pricing for the cable companies, which, because of their distribution method (i.e., the pipes into homes) have the ability to turn networks on or off. Comcast could offer the Pac-12 Networks’ national feed on one system in Pennsylvania, for instance, but not on another. In other words, DirecTV would have been on the hook for $0.10 per subscriber per month for all 15 million (approx) of its customers outside the Pac-12 footprint — that’s $18 million per year — whether those customers wanted the Pac-12 Networks’ national feed or not. And the satellite giant believed that most customers in the eastern half of the country didn’t care about the content on the Pac-12 national feed. DirecTV had emerged from a carriage fight with Fox in the fall of 2011 and was about to enter another with Viacom. It was also in negotiations for the upcoming, and expensive, Lakers channel on Time Warner Cable. Against this backdrop stood the MFN hurdle for the millions of DirecTV customers outside the Pac-12 footprint. By mid-summer, Chang had stepped away as the lead negotiator. (He would leave DirecTV at the end of the year.) But his replacement, Dan York, held the line. On Aug. 15, 2012, the Pac-12 Networks launched with a groundbreaking structure of one national and six regional feeds designed to super-serve local fans. Two weeks later, the football season began with USC ranked No. 1 and no DirecTV distribution for the Pac-12 Networks. The pressure for a deal increased by the day. The Pac-12 seemingly had one option: Eliminate subscriber fees for DirecTV’s customers in the the Tier 3 zone (outside the footprint). But because of the MFN, it would have been forced to do the same for all subscribers on all systems. Concerned that the business model would sustain long-term damage, the conference declined, according to two sources. One week into the 2012 season, the Pac-12 signed a carriage deal with DirecTV’s primary competitor, DISH, which, crucially, had a different subscriber base. At that point, one week into the season, DirecTV assessed the response of its customers: How many would cancel, or threaten to cancel, if the satellite provider did not carry the Pac-12 Networks? The company would have to be pushed to the tipping point, where it would lose enough in subscriber fees to make a deal with the Pac-12 Networks — something in the neighborhood of $40 million – $50 million annually — worthwhile. The ongoing stalemate suggests that point was never reached. One reason — perhaps the reason: Content. As soon as the schedule is released, each network selects two games for broadcast. In other words, the Pac-12 Networks never have access to the four best matchups in any given season — the games that could be used as leverage. Notre Dame at USC: Never on the Pac-12 Networks. Stanford-Oregon (during the heyday of that rivalry): Never on the Pac-12 Networks. After the four choice games are removed from the inventory pool, ESPN, Fox and the Pac-12 Networks make their weekly selections; the contract gives ESPN and Fox the top picks. The Pac-12 Networks are always left with non-conference games involving FCS opponents and with the second-tier games once conference play begins. That package of content has never been compelling enough to force enough DirecTV customers to switch, or threaten to switch, to a provider that carries the Pac-12 Networks. SEC fans would erupt if they couldn’t watch their favorite team play Northern West Central Oklahoma State. Pac-12 fans? Not so much. “(The Pac-12) thought if they did the deals with the cable companies, the situation with DirecTV would work itself out,’’ a source said. AT&T, which has a carriage deal with the Pac-12 through U-verse and a wide-ranging sponsorship deal with the conference at large, acquired DirecTV in 2015. Even that failed to end the impasse: AT&T’s proposal for DirecTV carriage was so one-sided that the Pac-12 presidents rejected it by a unanimous vote.